It's not often that you get the chance to say, "You probably won't know this song, it's pretty obscure" about a hit song. Now, thanks to this graph, you can. 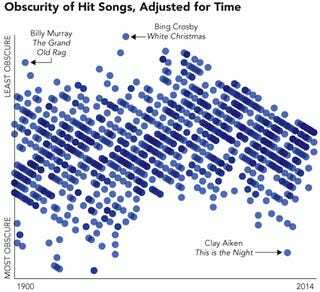 Very Small Array put together this graph of the hit songs that either went on to become cultural touchstones or to simply disappear from public consciousness without nary a trace. To get the obscurity data, VSA gave each song a score based on the number of Google and Wikipedia hits and plays on last.fm. Because the data was heavily influenced by whether a song was a hit 10 years ago or 100 years ago, VSA also adjusted the data for time of the release. Even corrected for time, though, the most obscure songs are still tilted pretty heavily towards the early 1900s, with one recent memory anomaly: Clay Aiken's 2003 single This is the Night. The least obscure song, as becomes painfully clear the closer we edge to December, is Bing Crosby's White Christmas.